Monster High - Muñeca Scaris Catrine DeMew, la muñeca Catrine DeMew de la colección 'Viaje Scaris'. Catrine es un personaje del especial para tv Viaje Scaris. 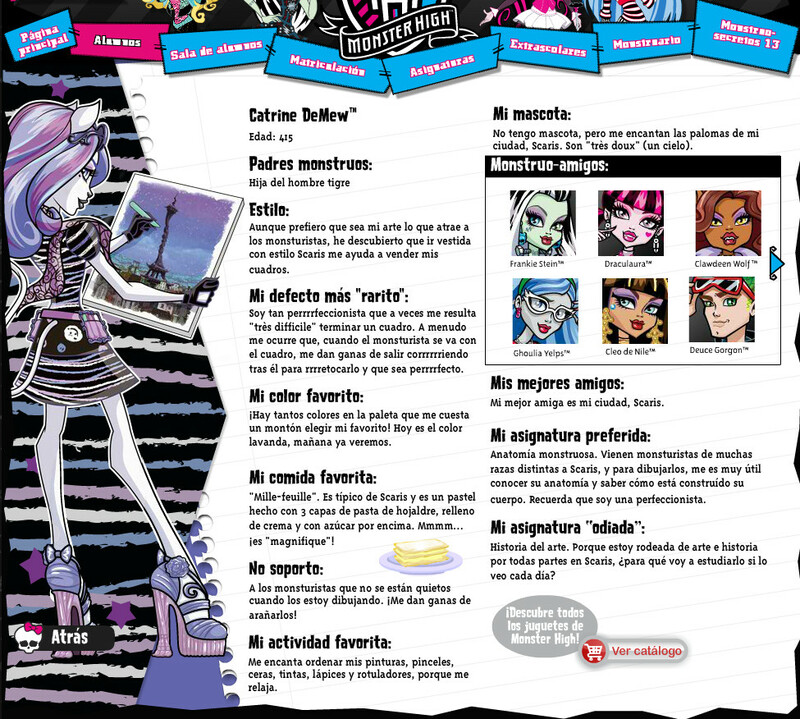 Es esta aventura Clawdeen Wolf es invitada a participar en un concurso y convertirse en la aprendiz de Monatella Ghostier. Catrine es una gran artista y le encanta su ciudad Scaris. Catrine viene con su versión superfashion de su vestido original e incluyen accesorios. Advertencia: Peligro de asfixia, contiene piezas pequeñas que podrían provocar asfixia en caso de ser ingeridas por el niño/a. No recomendable menores de 3 años. Allow me to introduce you to Miss Catrine Demew, a Scarisian Werecat. Shes 415 years old and her parents are Werecats in Scaris France. Catrine loves everything about art, drawing, painting, even making chalk pictures on the sidewalk. She carries a sketch book with her everywhere. 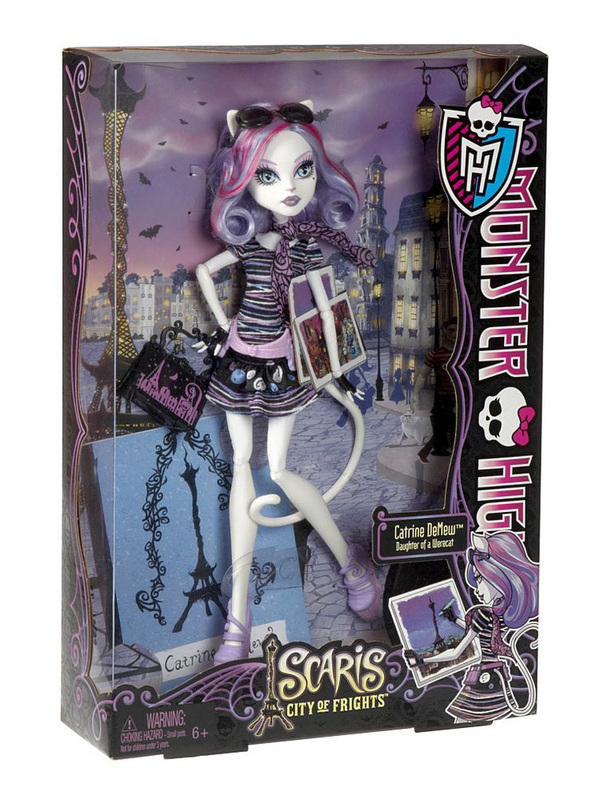 Catrine meets the Monster High ghouls when they travel to Scaris to support Clawdeen Wolf as she competes to become the apprentice to a world famous fashion designer. They become acquainted at an art museum and become ferocious friends. Catrine was named for the famous actress Catherine Deneuve, who starred in several horror films. Cat has milk white fur and shoulder length purple and pink hair. Her cats eyes are a beautiful shade of blue. She has a long tail and wears all the latest killer kouture Scaris fashions. Some of Catrine Demews favorite things are Mille-feuille - a French puff pastry filled with sweet scream, learning about the anatomical features of monsters in school, the color lavender, and the pigeons that fly around Scaris. Her freaky flaw is that shes a purrfectionist. She especially dislikes it when her monster friends don't sit still as she draws their portrait. Each doll wears a new travel outfit complete with jewelry and comes with a rolling suitcase and travel journal or sketchbook to capture those memorable moments. Also includes hair brush and doll stand for picture perfect snapshot poses.